Stockholm, Sweden, has a very developed and efficient public transportation system. 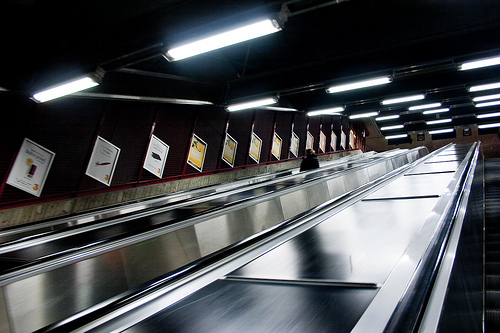 People who use this system have the option of buying a Stockholm Card, where they get unlimited rides and can transfer between the different modes. 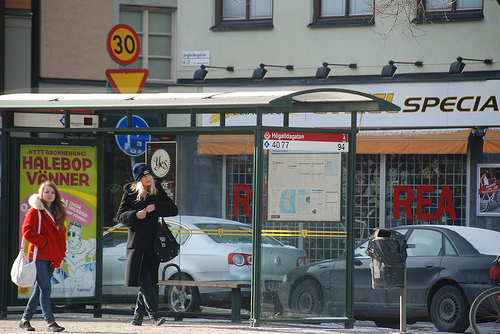 Otherwise, this system uses a coupon system, in which Stockholm is divided into zones, and the farther the passengers travel, the more coupons they need to purchase. Transit tickets can be bought at SL Public Transportation Centers, newsstands or Metro platforms. There are many different lines within Stockholm’s bus system. The regular bus lines are painted red, but there are also some inner city blue buses and suburban blue buses. There are also service bus lines that work as transportation for elderly and handicapped people in some residential parts of the city. A lot of the roads in Stockholm have special lanes where only buses are allowed to drive. Passengers cannot buy tickets on board the buses, but most stops have ticket machines. These trains run from 5:00 AM-1:00 AM, but there are extended hours during the weekends. The wait for a train can be between 2-30 minutes, depending on the time of day. Click here to view a map of the metro system. This city has three regular light rail lines that cater to specific neighborhoods or suburbs in Stockholm. None of these lines are very long, but they all link up to the Metro. There is one heritage line in Stockholm, called the Djurgarden Line, that rides between Norrmalmstorg and Waldemarsudde. Its course is about kilometers, and there are 10 stops; it is numbered as the 7. As Stockholm was built on a series of islands, there are a few ferry lines. One commonly used boat in Stockholm is the Djurgården ferry, which goes between Djurgården and Slussen. It functions most of the year, and departs every 15-30 minutes, depending on time and day of the week. Stockholm Cards are not valid on this system. Aaaah Sweden. It is one country that I have always loved. I look forward to visiting that country and see its beautiful scenery and people. Love u sweden. Sweden is a constitutional monarchy with a parliamentary democracy of government and a highly developed economy. Sweden emerged as an independent and unified country during the early Middle Ages. In the early 17th century, the country expanded its territories to form the Swedish Empire. Sweden is one of the most educated; healthy infra structurally developed countries in the world. From south to the northern parts, beautiful landscapes, fertile farming – lands from the south towards the northern parts, meadows, pastures to high mountains and wild forests beautify the Swedish landscape. The Swedish fauna is rich with a variety of orchids and different kind of flowers and plants. Oak trees in the south, birch and pine trees in the north. Elk, black-bear, wolfs and deer can be found in the middle and northern parts of Sweden. A variety of seasonal migrating birds, including hawks and eagles. Archipelagos with beaches and a great nature environment for sailing, hiking and skiing. Swedish citizens have almost free health care, 2 years paid home-leave for parents with new born children, 5 weeks guarantied vacation, is the law, and active unions. Sweden has long been involved in humanitarian efforts. Many people from poor unemployed countries, primarily from the Baltic area including Finland, were given jobs, education and housing in Sweden. Because of immigration Sweden has a significant Muslim population, the number of Muslim immigrants are about 500,000, today the Muslim immigrants are well adopted into the Swedish society. However the generous immigration policy of Sweden is a memory of the past. At the end of 2009,71.3% of Swedes belonged to the Church of Sweden (Lutheran).The 20 largest (by turnover in 2007) companies registered in Sweden are Volvo, Ericsson, Vattenfall, Skanska, Sony Ericsson Mobile Communications AB, Svenska Cellulosa Aktiebolaget, Electrolux, Volvo Personvagnar, TeliaSonera, Sandvik, Scania,ICA, Hennes & Mauritz, IKEA, Nordea, Preem, Atlas Copco, Securitas, Nordstjernan, and SKF. Sweden is maintaining its own currency, the Swedish krona, (SEK).